The Artist’s Way – What is it? It’s a personal ‘change management’ program. Resilience can be learned, and all the tools you need are right here. It is a process. 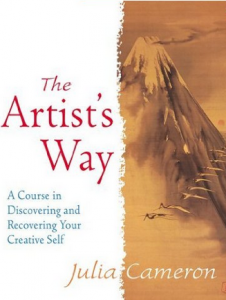 Julia Cameron’s pioneering, and now long proven, the method of “Recovering your Creative Self” is outlined over twelve deceptively simple chapters. By completing the weekly assigned Tasks you begin a disciplined process of examining the obstacles to becoming the best you can be. The Morning Pages allows you to develop a daily writing practice which clears the mind of distractions and anxieties, freeing up space for creativity to flourish. Exercising the discipline of a weekly Artist Date, “assigned play”, you afford yourself quality self-nurturing time. Why? Mindfully present and alone you open yourself up to inspiration, guidance and insights. It becomes a program for life. The tools keep you deliberately & intentionally focused, you will come to rely upon them. They deliver the insights and impetus you need to become and remain resilient. Most significantly, you will have learned to manage future changes in your life confidently. Today’s survival skills are left behind. These become tomorrow’s “thrival” skills. Spring 2019 groups are currently forming in Belfast, Dublin, Counties Louth, Down and online. Register interest on the form to your right. We’ll let you know when one is starting nearby.